Okay for Now by Gary D. Schmidt. Grades 5-8. Houghton Mifflin Harcourt, April 2011. 368 pages. Review copy provided by my local library. It's 1968 and fourteen-year-old Doug Swieteck has just moved to a new town with his family. Life's not easy for Doug there. No one expects much of him or his family and Doug never knows what to expect from his father, who flies violently off the handle at the smallest thing. Two things help him get by: the book of Audubon prints at the town library (and the librarian who's helping Doug learn to draw them) and Lil Spicer, a feisty girl in his class who becomes Doug's unlikely ally. As Doug tries to navigate his eighth grade year and the sides of his personality that would have him act just like his violent father and brothers, he's just hoping that things will turn out okay... for now. CONFESSION TIME. I put off reading thing book. I felt kinda "meh" toward The Wednesday Wars, which won a Newbery Honor. So, even though I kept reading very enthusiastic reviews and it was getting tons of Newbery buzz, it took the insistence of my good friend Kate to push me over the edge and get me to pick up Okay for Now. Y'all, once I picked it up, I could not put it down and I didn't want it to end. I instantly felt fiercely protective of Doug Swieteck. You can tell from the first that some unsavory stuff is going on in his family, but you can also tell that Doug is a good kid who's gotten a bad rap. Doug's father is a mean man who's bred mean boys, but that's an impulse that Doug is constantly struggling to recognize and curb in himself. And despite the fact that Doug's world feels very gray a lot of the time, he's constantly looking for beauty. I'm not lying when I saw that Hollywood actresses would kill for my mother's smile. You think Elizabeth Taylor can smile? If you saw my mother's smile, you wouldn't even let Elizabeth Taylor in the same room. Right away, you get Doug's voice, you understand what's important to him, and you see how he sees his mother. The arts play a very important role in this book. To put it simply, art saves Doug, and it appears again and again. Doug's artistic pursuits with the Audubon prints give him a sense of accomplishment when not much else is going right. His librarian friend/art teacher gives him a supportive male role model when no other can be found. And Doug communicates his feelings through his interpretation of the Audubon art prints he views and copies. There's no question that art saves Doug. It's not simply an extracurricular, it's the thing that's getting him through. This is a book that can be experienced on many different levels. Kids are going to dig the mixture of humor and seriousness. Doug is a character that many of them will be able to identify with. He's real: he has trouble reading and adults don't always trust him and he's got a lot on his plate that he's not sure how to deal with. I'm apparently in a very serious mood as I write this review, but I shouldn't downplay the humor. Doug's got many lines that will make kids laugh out loud. Adults reading will get a kid out of Doug's childlike frankness, the way that he's saying things as only a kid would say them. Gary Schmidt's got that 14-year-old voice down. For me, this book really raised the question of how expectations shape actions and how adults can make up for the mistakes they make with kids. Once trust has been breached, how do we build it back up? Adults have the responsibility to set good examples, to keep an open mind, to give the benefit of the doubt to kids whenever possible. Children and teens can put a remarkable amount of trust in adults. And sometimes adults betray that trust, even if they don't mean to. Doug's seen quite differently by adults when he's carrying Jane Eyre around with him than when his brother's been accused of committing a crime. In the book, different perceptions definitely affect how adults interact with Doug. This is a book that every teacher, parent, administrator, anyone who works with teens should read. Check out more reviews at: 100 Scope Notes, Confessions of a Bibliovore, Book Nut, Eva's Book Addiction, Everyday Reading, Forever Young Adult, The Fourth Musketeer, A Fuse #8 Production, GreenBean TeenQueen, Jen Robinson's Book Page, and The Reading Zone (among others... I am, apparently, late to the party). 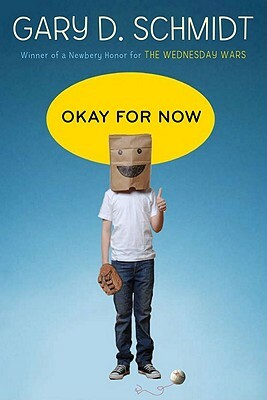 Okay for Now is on shelves now!